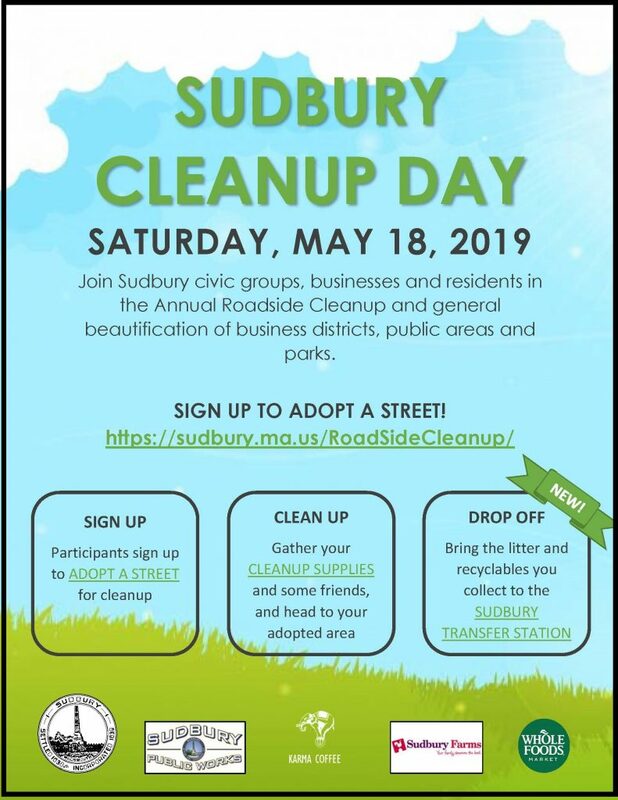 Join your friends and neighbors in Sudbury’s Annual Roadside Cleanup Day and general beautification of Sudbury roads, public areas and parks on Saturday, May 18, 2019. We need everyone’s help in this important effort. Each year, Sudbury civic groups, businesses and residents volunteer their time and energy to pick up litter all over town. 1. Sign Up – Participants sign up to Adopt a Street for cleanup. On May 18, 2019, everyone who volunteered picks up litter discarded in the area(s) they selected to beautify. 2. Clean Up – Gather your cleanup supplies and some friends, and head to your adopted area. Bag up any litter you find and separate out recyclable items, if possible. NEW! 3. Drop Off – Bring the litter and recyclables you collect to the Sudbury Transfer Station, located at 20 Boston Post Road. That’s it! 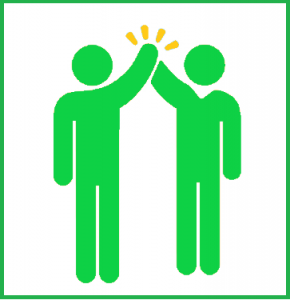 Sudbury’s roads and parks will be cleaner and healthier thanks to your efforts! This year, Cleanup Day participants receive a one-day pass to drop off the litter and recyclables collected during Cleanup Day at the Transfer Station. Pay-As-You-Throw bags are not required for Cleanup Day trash. Drop off hours are 8AM – 3PM on May 18, 2019. What is the Transfer Station? Located at 20 Boston Post Road (Rt. 20), the Transfer Station is Sudbury’s municipal waste disposal and recycling facility. It is available to residents who purchase an annual pass (sticker) and uses a pay-per-throw bag disposal system for garbage. A map, recycling guide and more information can be found in the Transfer Station Guide. You do not need to be a Transfer Station member or use a pay-as-you-throw bag for Cleanup Day litter. Just bring your pass to be admitted to the Transfer Station on Saturday, May 18. Any recyclable items that are collected can be processed at the Transfer Station as well. For more information about Transfer Station recycling, please see the Recycling Guide. We encourage volunteers to please use their own trash bags as no special type is required. Those who prefer to do so, may pick up garbage bags at the Board of Selectmen’s Office, 278 Old Sudbury Rd, Flynn Building, during regular business hours. All Cleanup Day participants are asked to review Cleanup Day Safety Tips and Supplies Checklist prior to heading out for Cleanup activity. For high school students, volunteer hours on Cleanup Day are eligible for Community Service credit. Please stop by the Selectmen’s Office during regular office hours to have your form signed. 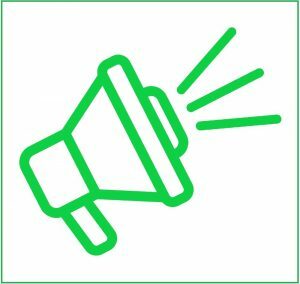 Let your friends and neighbors know about Sudbury Cleanup Day! Print out and post the Cleanup Day Flyer (please recycle the flyers afterwards), share the Facebook Event, and be sure to post a Cleanup Day selfie on Twitter with #SudburyCleanUp. As a way of saying “Thank you” for pitching in on Cleanup Day, Karma Coffee will be offering free coffee and baked goods, courtesy of Sudbury Farms and Whole Foods, to Cleanup Day participants! Just stop by Karma Coffee (located down the street from the Transfer Station) on Cleanup Day and present your Cleanup Day Transfer Station Pass to get a cup of their signature coffee or a fresh baked cookie. A big thank you to Karma Coffee, Sudbury Farms and Whole Foods for their generous and delicious donations, and a very big thank you to the Sudbury residents, families and groups who participate in Cleanup Day! We look forward to seeing you on May 18 and thank you for your help!